Space Weather Aurora Sun Sunspots Flux. This page highlights some of the features of the Weather Satellite application relating to the sun and space. The application shows the aurora forecast for northern and southern hemispheres, solar cycle sunspot number, 10cm radio flux, planetary A index, and space weather overview. 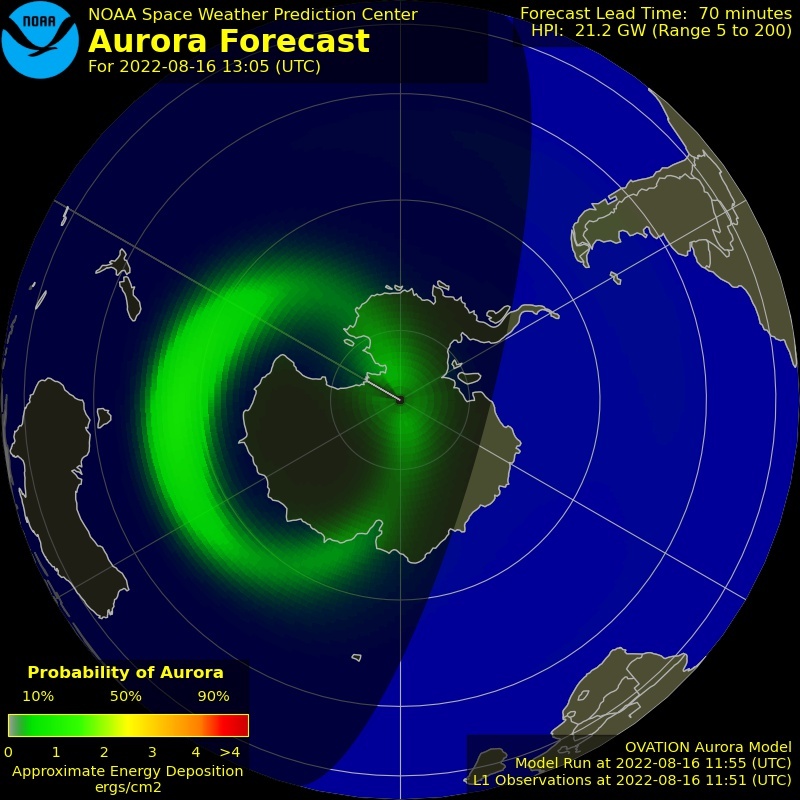 Area within red has viewable aurora. Green is aurora. Shows solar x-ray, proton flux, and geomagnetic activity. Shows sunspot number. Quantifies the number of sunspots on the surface of the sun. Shows 10cm radio flux radio emissions. The solar radio flux at 10.7 cm (2800 MHz) is an excellent indicator of solar activity. Shows A index value. K-index Alerts are issued when NOAA estimated Kp-indices reach 4, 5, 6, 7, 8, or 9. 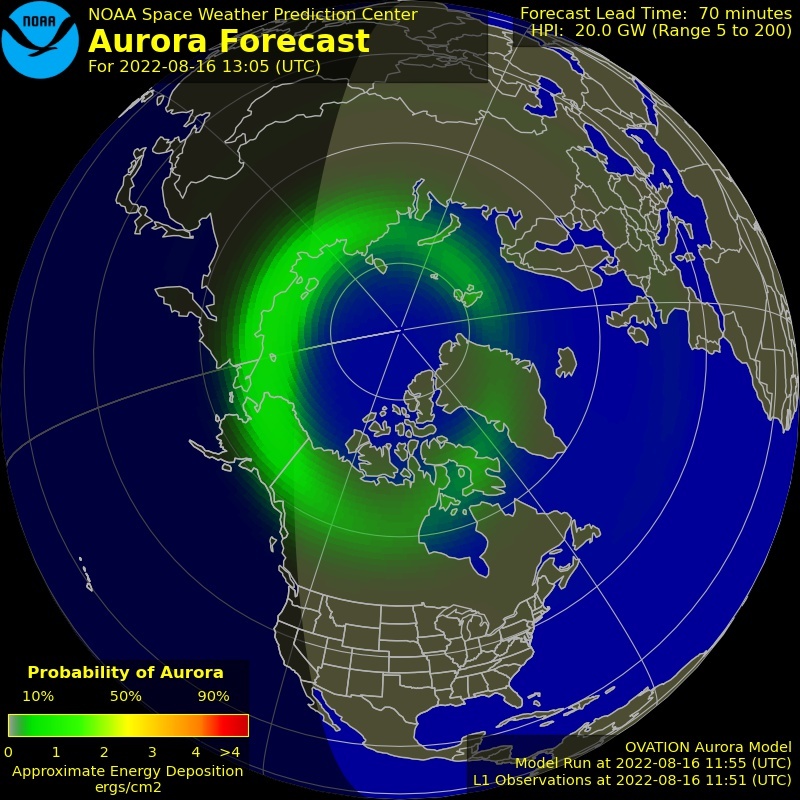 The K-index quantifies disturbances in the horizontal component of earth's magnetic field with an integer in the range 0-9 with 1 being calm and 5 or more indicating a geomagnetic storm. The Station A and K indices show the fluctuations in the magnetic field, tied to specific geographic locations. The indices have a range from 0 to 9 and are directly related to the maximum amount of fluctuation (relative to a quiet day) in the geomagnetic field over a three-hour interval.